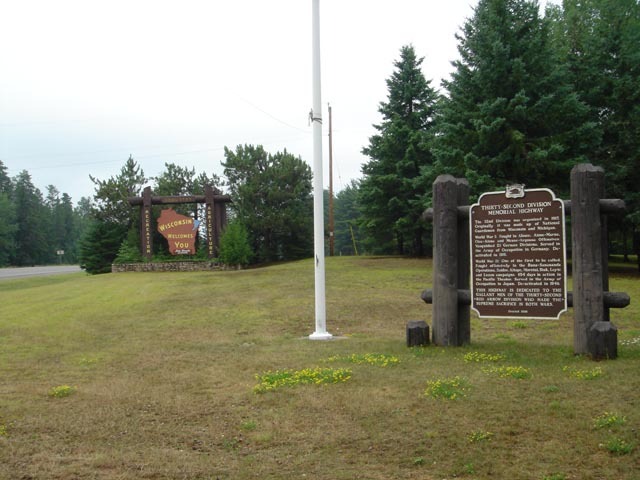 Located Wisconsin state line on highway 45 south Coordinates Lat N 43:08':417" Lon W 89:12':365"
The 32nd Division was organized in 1917. Originally it was mad up of National Guardsmen from Wisconsin and Michigan. World War I: Fought in Alsace, Alsne~Marne, Olse~Alsne and Meuse~Argonne Offensives. Vanquished 23 German Divisions. Served in the Army of Occupation in Germany. De`activated in 1919. World War II: One of the first to be called. Fought offensively in the Buna~Sanananda Operations, Saldor, Aitape, Morotal, Blak, Leyte and Luzon campaigns. 654 days in action in the PAcific Theater. Served in the Army of Occupation in Japan. De~activated in 1946. 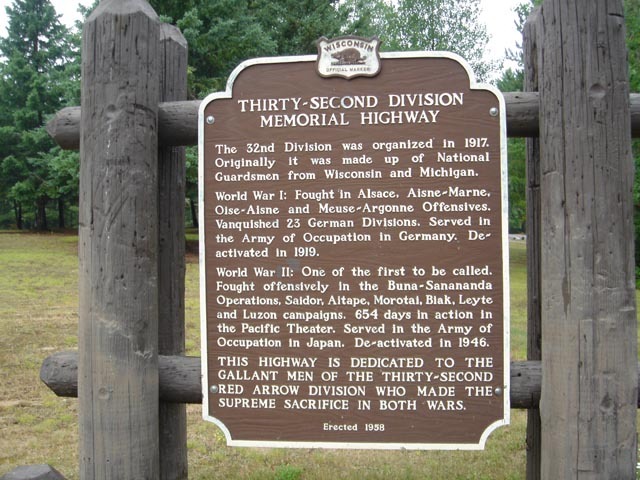 THIS HIGHWAY IS DEDICATED TO THE GALLANT MEN OF THE THIRTY~SECOND RED ARROW DIVISION WHO MADE THE SUPREME SACRIFICE IN BOTH WARS.